Piñatex™, innovative and sustainable textiles from pineapples! Carmen Hijosa has a well-honed eye for beautiful things having worked with luxury leather goods for more than twenty years. Her Damascene moment came when a piece of consultancy work took her to a leather tannery in a developing country. The impact was laid bare, and shocking. Soon after she was engaged by a Philippine client to upgrade their leather goods for export. Rather than working with leather (which was imported), Carmen advised looking at local materials readily available in the Philippines. 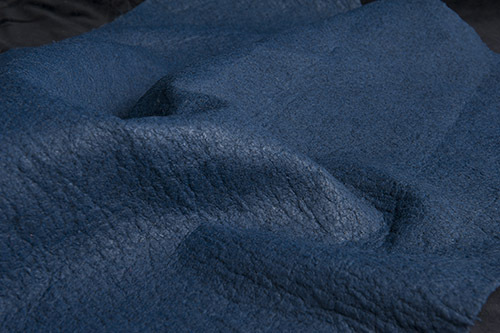 Over five years of research and development, and a PhD at the Royal College of Art, following culminating in the launch of Piñatex™, a natural and sustainable non-woven textile by Ananas Anam Ltd, backed by the InnovationRCA, and protected by patent. Piñatex™ is made from fibres of pineapple leaves, which are usually discarded and left to rot when the fruit is harvested. The fine, flexible fibres are extracted from the leaf through a process called decortication. Once degummed, the fibres are surprisingly soft to the touch and breathable. They are processed into a non-woven mesh textile at a local factory in the Philippines, then shipped to a finishing factory near Barcelona, Spain. The company already has sufficient scale to meet orders of up to 500m of fabric in a variety of colours, finishes and thicknesses. As the Piñatex’ pineapple fibres are a by-product of the fruit harvest, no extra water, fertilizers or pesticides are required to produce them. The textile, which is renewable, compostable, and tactile is also amazingly versatile as it is mouldable and easily dyed. It feels like felt, and is suitable for a range of finishes: waxed it looks like leather; embossed it looks like an animal or reptile skin (pictured above); and the metallic finish adds a whole new glamorous edge. 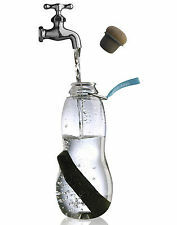 The current water-resistant coating, while technically biodegradable, still contains a tiny amount of petro-chemicals, so Hijosa is working with Bangor University, supported by an innovation voucher from InCrops (specialists in biorenewables and bio-based products) to develop a completely compostable, non-petroleum based coating. 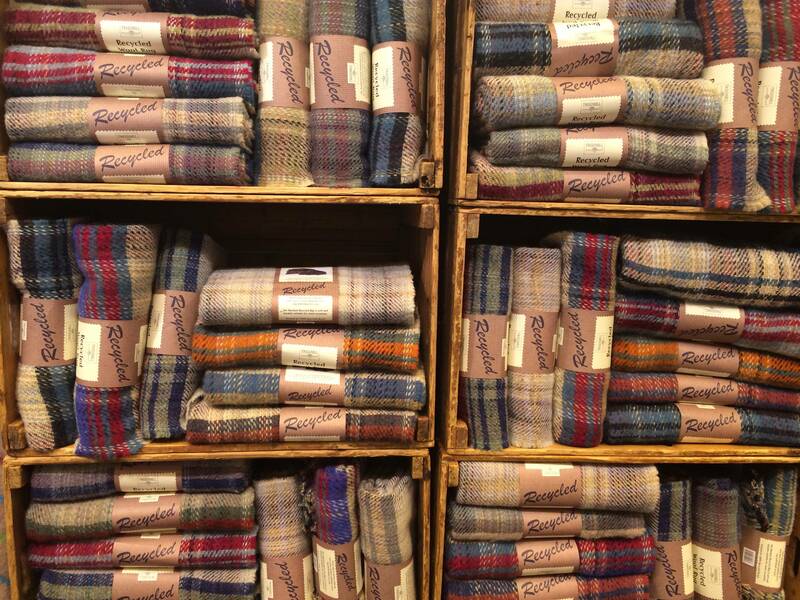 The textile has direct appeal to the fashion, accessories and furnishing industries. Having passed all the technical tests (ISO international standards for: seam rupture, tear resistance, tensile strength, light and colour fastness and abrasion resistance), a number of key brands are now using the textile to develop prototype products. At around £18 per metre, Pinatex is more economical than leather (typically around £30 per metre), and there is much less waste. 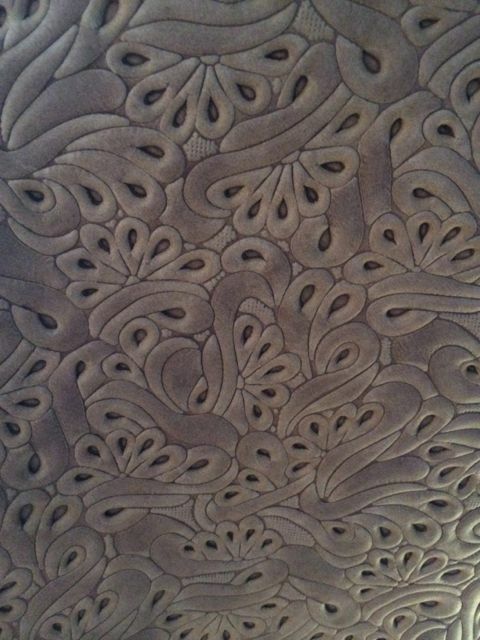 The irregular shape of leather hides leads to significant wastage of around 25%, where as Pinatex is available on 218cm or 150cm wide rolls. This week sees the first official presentation of Pinatex, the Pine-Apple Show, Imagine everyday through Piñatex™ at the Royal College of Art, Kensington Gore, SW7 2EU from 12th -17th December. Prototype products made from Piñatex™ designed by Ally Capellino, Camper, Puma, John Jenkings in collaboration with Ulterior Design Upholstery, Patricia Moore, Dagmar Kestner, SmithMatthias and Julia Georgallis will be on show. The event is supported by the RCA, the Philippine Embassy and the Philippine Trade and Investment Centre in London, underlining the potential for this product to support sustainable livelihoods. Hijosa has worked in partnership with an agricultural co-operative in the Philippines to source the material. The fibres represent only 5% of the leaf, so the remaining biomass, the by-product of decortication, can be converted into organic fertiliser (typically the farmers’ greatest cost) or bio-gas. 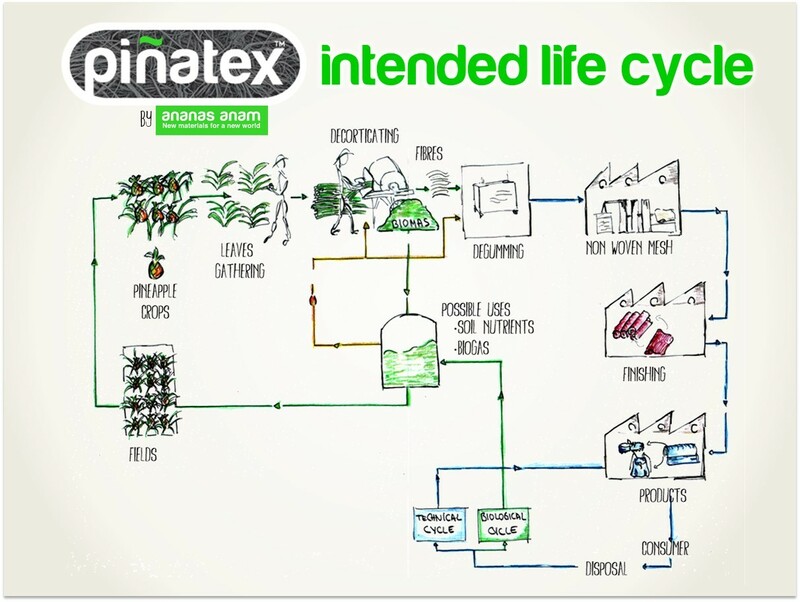 So Pinatex has the potential to offer the farmers two new revenue streams, from the fibres and the bio-mass. 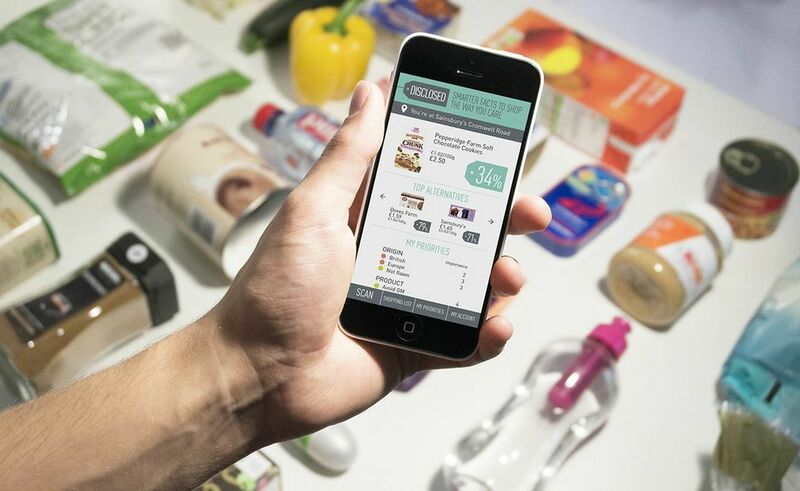 The process uses tried and tested technologies reducing barriers to scaleability. Hijosa aims to replicate the production in other geographies, providing sustainable livelihoods for agricultural communities, and perhaps introducing greater variety to the range of finishes and products based on different traditions. In time, and with the support of the Philippine Textile Research Institute, the existing finishing partners in Barcelona and Hijosa intend to develop the skills and knowledge to finish the textile in the Philippines. PiñatexTM is more than a versatile non-woven, natural textile with great aesthetic and technical performance; the whole life-cycle of the textile has been designed and developed along Cradle2Cradle principles, in fact, Dr. Michael Braungart, author of “Cradle to Cradle: Remaking the Way We Make Things” is assessing Hijosa’s PhD thesis. Pinatex is a story of innovation finding beauty and inspiration in the discarded. In conversation recently, Edward Wilson, winner of the Pulitzer Prize, reminded us we are stewards, not owners of the biosphere. Wilson is a primary authority in the disciplines of sociobiology and biodiversity whose career spans more than sixty years, and it is from this vantage point that he cautions “the attack on biodiversity, in an attack on ourselves”. Wilson was in the UK to promote his latest book, The Meaning of Human Existence, and launch the MEMO (Mass Extinction Monitoring Observatory) Project. MEMO’s mission to inform, to educate, and inspire action to protect biodiversity. The monumental stone building spiralling out of the ancient Jurassic Coast will embody images of species lost to extinction in recent times. Species extinction rates are more than a 1,000 times the background rate, and the International Union for Conservation of Nature (IUCN) estimates that more than 22,000 of the 73,600 assessed species, are threatened with extinction. Assessed species represent only a fraction of the 1,889,587 described species. Without assessment we can not know the full extent of the damage, but we do know biodiversity ensures resilience. The main threats to species are from human activities, primarily those driving habitat loss and degradation, introduction of alien species, over-exploitation of natural resources, pollution and climate change. Awareness of the fragility of our ecosystems, is growing, but action is lagging. 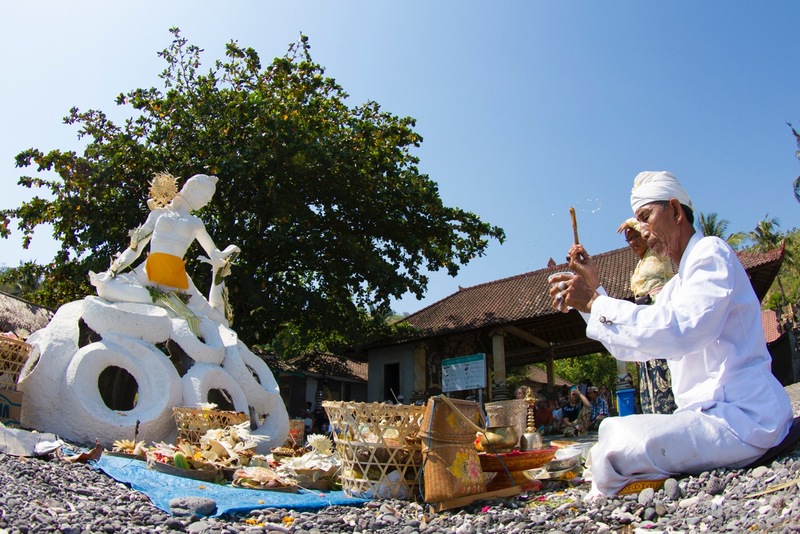 Last week as part of Sustainability Week @theHospitalClub, a private members club in London, the Marine Foundation launched a short film celebrating Apsara, Spirits of the Sea, a living sculpture in the sea, inspired by ancient, beautiful, dancing Hindu spirits. 9am was early for a private view, but the audience were drawn by tales of mermaids and sea nymphs. Celia Gregory, founder of the Marine Foundation and artist, knows we are visual creatures. Images trigger an emotional response and can shift a mindset in a way that statistical lists can provoke scepticism. The sea nymphs’ freedom and beauty belies their threatened habitat. Coral reefs are among nature’s most diverse, breathtaking and critically endangered eco-systems, with 33% of reef building coral threatened. Often damage to the oceans is unseen, hidden from view below the surface, or lost in its great scale. Reef balls, eco-stars and coral nurseries are some of the techniques that have been used to rehabilitate reefs damaged by storms or human interventions. Echoing another quote attributed Wilson, “You teach me, I forget. You show me, I remember. You involve me, I understand”, the Marine Foundation works at sites with where the coral reefs has been damaged, but there is eco-tourism potential, and crucially, the local community is involved. Ongoing management and marine spatial planning (removing predators, transplanting corals, controlling anchoring, establishing fishing restrictions, and opportunities for guardianship) are vital for restoration to be effective Fishing restrictions around the reef create safe breeding grounds for fish and improve the catch nearby. Sharing knowledge and information from the nearby Karang Lestari Biorock Coral Reef and Fisheries Restoration Project in Pemuteran, winner of the UN Equator Award for Community-Based Development and the Special UN Development Programme Award for Oceans and Coastal Zone Management in 2012, engaged the fishing community, who arranged for a blessing ceremony for Apsara (pictured above) and helped sink the sculpture. Opening the same day, Here Today, curated by Artwise, celebrates the 50th Anniversary of The IUCN Red List of Threatened and Endangered Species, and supported by Baku Magazine. Works of world famous artists such as Tracey Emin, Andy Warhol, Gavin Turk, Peter Blake, United Visual Artists, Douglas Gordon, and Julian Opie are interspersed with those of newer talents, all implicitly asking whether our endangered species will be gone tomorrow. The first chapter entitled Human Footprint brings us face to face with some of our impacts. Ocean plastic pollution is a relatively new problem, but vast: the UNEP Year Book 2014, states, “plastic waste causes financial damage of US$13billion to marine ecosystems each year”; the largest of four giant gyres (whirlpools of water trapping rubbish) is estimated to be the size of Texas, and contain 3.2million tonnes of plastic; 44% of all documented seabird species are found with plastic in their stomachs. The Midway film shows the painful death throes of young marine birds fed plastics. Alice Dunseath’s Plastic Shores Animations, (see n at the SustainRCA Show) reminds us that these same micro plastics are entering our food chain. Leyla Aliyeva’s experience Life, places a beating heart in the centre of a monochrome room of trees. 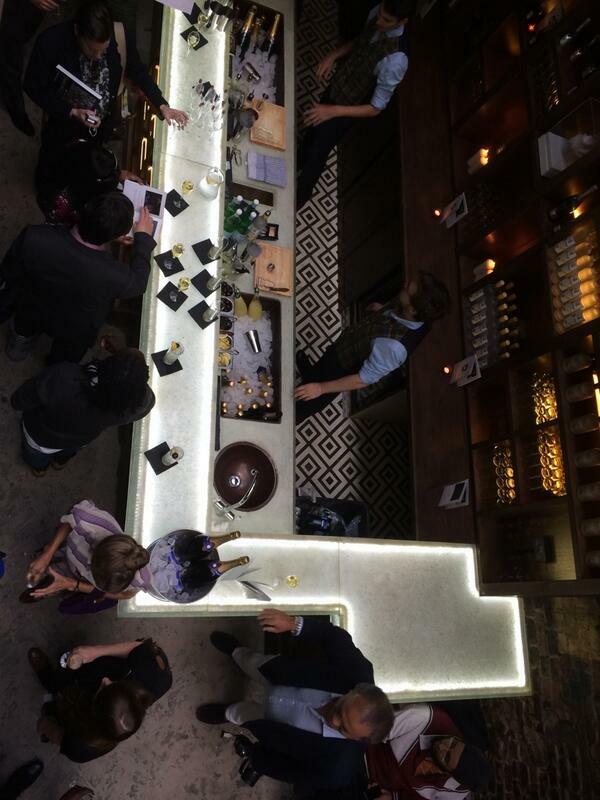 It is immersive and invites contemplation. Chris Jordan and Rebecca Clark’s Silent Spring depicts 183,000 birds, the estimated number of birds that die in the United States every day from exposure to agricultural pesticides. As with the 888,246 ceramic poppies planted for the Blood Swept Lands and Seas of Red installation the representation of an inconceivably large number is powerful. 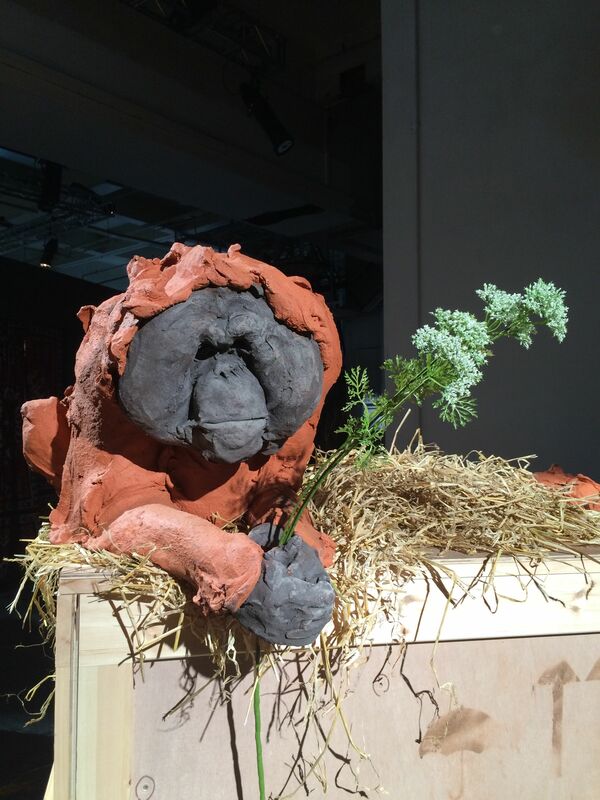 Stephanie Quayle‘s Congress, gathers clay sculptures of one of our closest, and most intelligent relatives, orang-utans in casual human poses, but bound for a gallery in shipping crates: for us to marvel, or because their habitat has been destroyed? The chapter Unsustainable Sea and Changing Landscapes explores the pressure that humanity is putting on nature with poignant works inspired by the disappearance and death of the Caspian and Aral Seas. Sayyora Muin’s Listen to the Silence of the Lost Sea, is a circle of women silently biding farewell to the Aral Sea, and their way of life The world’s fourth largest saline lake until the 1960s when two rivers that fed it were diverted for agricultural use, and the sea has slowly desiccated since. 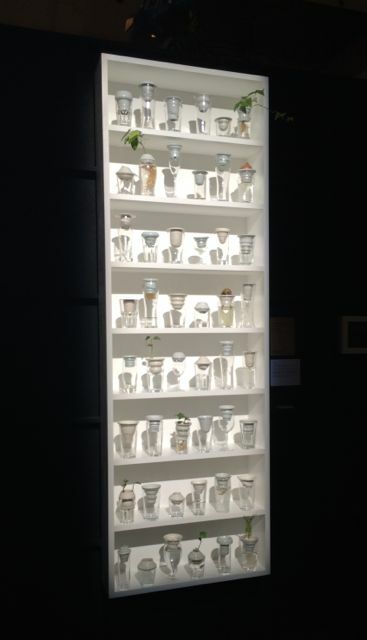 The final chapter, Here for the Future, shares the six key policy solutions outlined in the WWF Climate Solutions Report, next to Alicja Patanowksa‘s Plantation, an installation made of ceramics and discarded glasses,a n urban garden accessible to us all. Plantation is one of the innovative, engaging responses from recent graduates of the Royal College of Art curated by Julian Melchiorri. 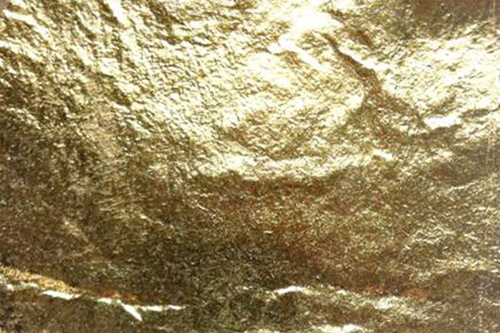 Melchiorri’s Silk Leaf made of a biological material made of silk protein and chloroplasts. 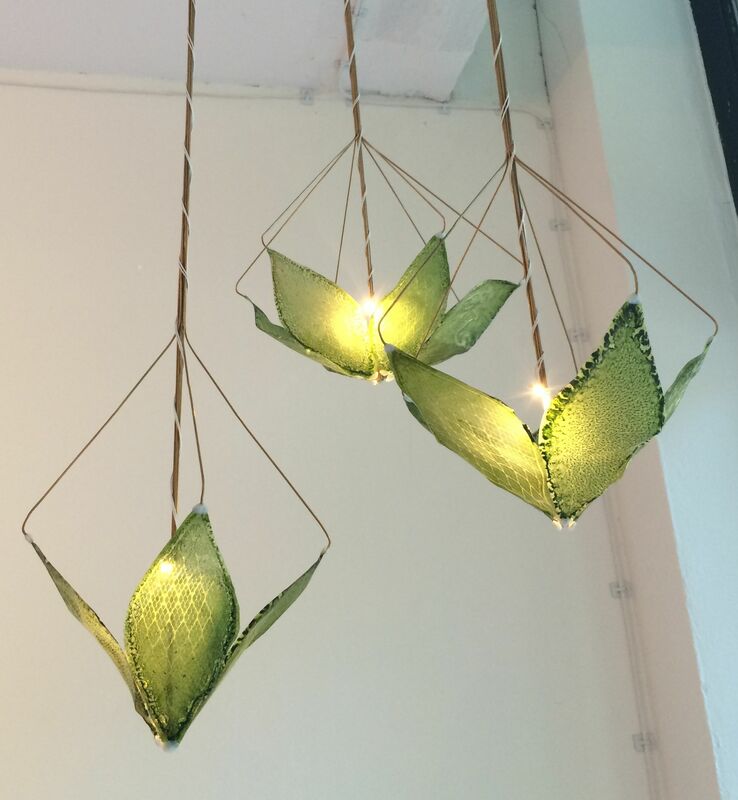 Silk Leaf absorbs CO2 and produces oxygen and organic compounds through photosynthesis. Melchiorri envisages building clad in photosynthetic facade breathing life into our cities. Other works revive materials turning ‘waste’ into luxurious textiles (Neha Lad), or human poo to clean fuel (Shruti Grover). The works are too numerous to mention, but Here Today, is at The Old Sorting Office, 21-31 New Oxford Street, WC1, until 17th December, so go be inspired! “The next millennium, if we are to avoid catastrophe, must be the green millennium…And the best, most dramatic and most reliable motivator of human behavioural change is beauty”, Elizabeth Farrelly. Are you sitting comfortably? Or may be you are on the hunt for a new three-legged seating friend? Here is my pick of five of the best stools! 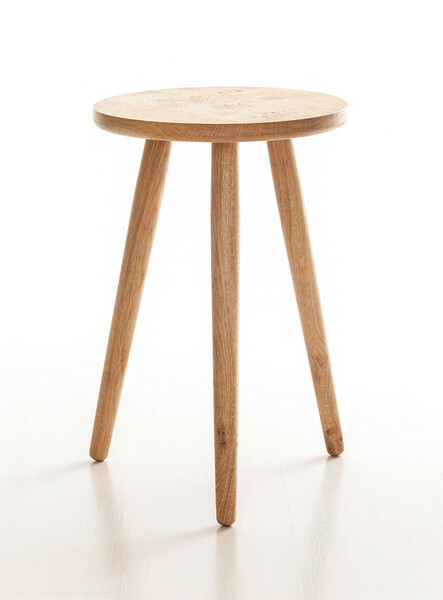 In celebration of the Galvin Brothers recent opening of their bricks and mortar store in Beverley, Yorkshire (11 Flemingate, HU17 0NP), my first pick is their signature stool, the English Pippy Oak Milk stool (£170). Pippy Oak, or Cat’s Paw Oak, is so named because of its characteristic pips or knots. The open, light nature of English woodlands, hedgerows and parks encourages ‘epicormic growth’, the shoots or buds, on tree trunks and at their base. These tumour-like growths penetrate deep into the tree’s heart wood. The grain moves around the knots to create beautiful patterns, revealed as ‘cat’s paws’ on the board The stool is handmade, with peg-and-wedge leg joints. Its clean, modern form is given distinct character by the unique pattern of the Pippy Oak. 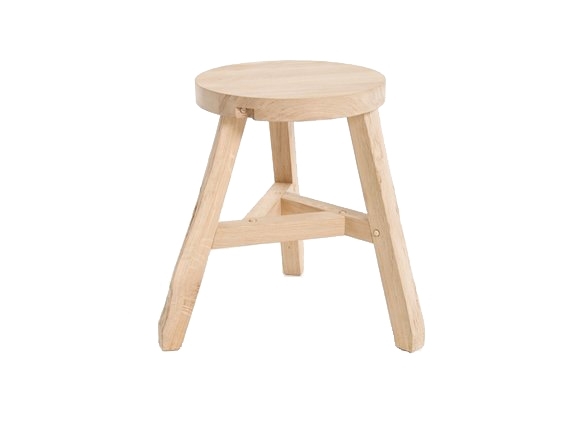 A rustic gent with potential as a stool, side or occasional bedside table. The stools are finished in Danish oil and the dimensions are 300 x 460 x 300mm. The second stool makes good use of the things that are found as by-products, or off cuts of industrial production processes. The top of Tom Dixon‘s Offcut Stool is made from the waney edge, edge that follows the natural curve of the tree (as in waning moon). 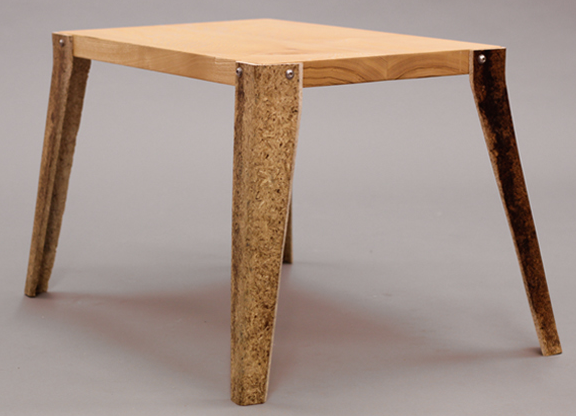 This irregular edge is often discarded, hence the name ‘Offcut’ stool. 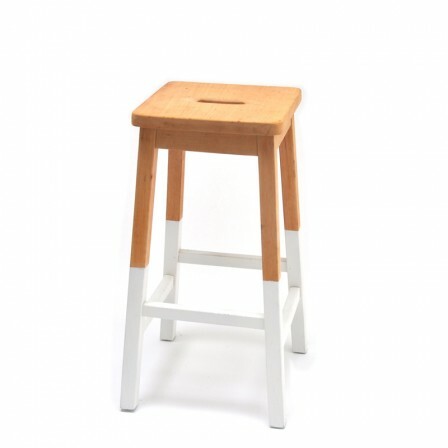 Made of solid oak and finished with a natural soaped finish, the stool comes flat-packed (with efficiencies of packaging and distribution) and is easily assembled using wooden pegs rather than screws or glue. Simple and honest. 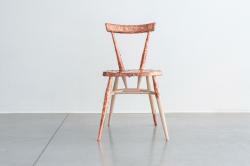 Available from Tom Dixon or Heal’s from £140. 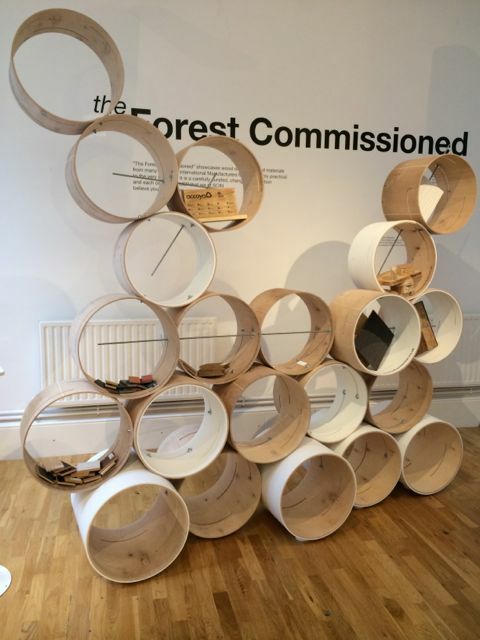 The third entry, Pippa Murray’s Just Wood stool also makes use of the neglected, in this case our unmanaged British woodlands. 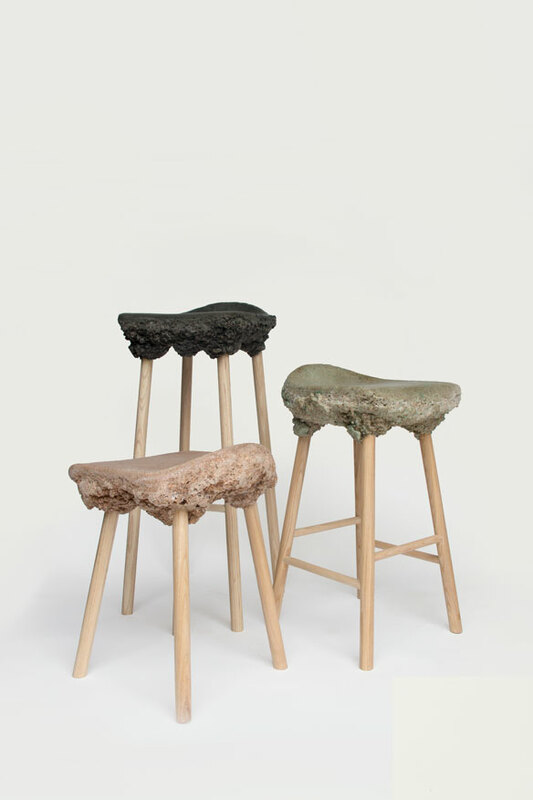 The legs of the stool are greenwood shavings that have been moulded using a process developed by Pippa as part of her final year research project studying Design Products at the Royal College of Art. Greenwood shavings are a by-product of coppicing hardwood trees, a traditional form of woodland management. 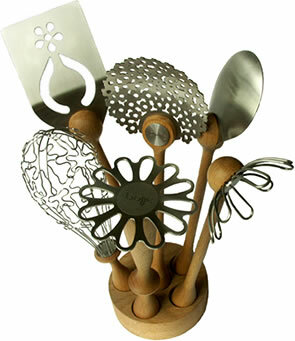 The moulded material is strong, polymer free and bio degradable. Dipped vintage lab stools from Ines Cole (£125, H 61 x W 34 x D 38 cm) have been taken back to their natural wood and then given a dip dye makeover sealed with a matt finish. A simple piece of upcycling that conjures up nostalgic images of my old school science lab, and perfect for the industrial vintage look. 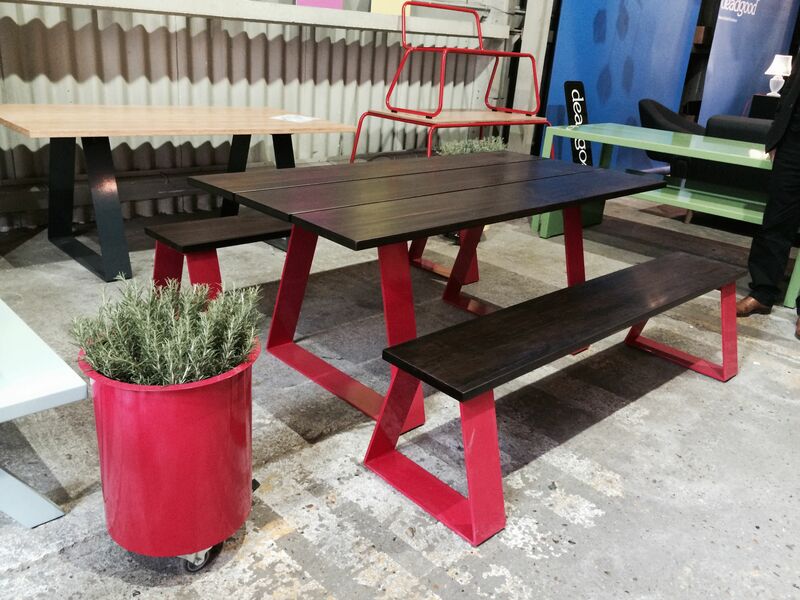 If you fancy a more colourful alternative, you can find similar stools at reclamation yards or antiques fairs and try a DIY dip. If not DIY, then what about grow your own? 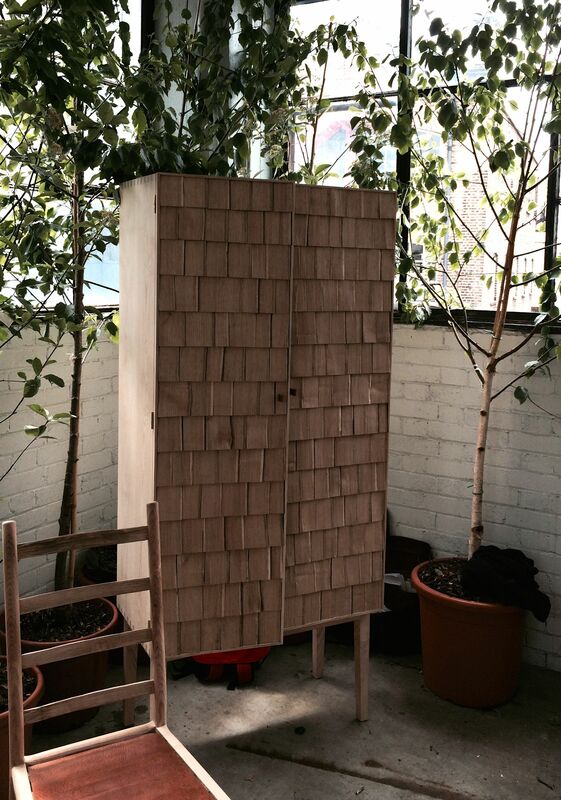 Typically there is 50-80% wastage in normal process of transforming raw timber to finished products. 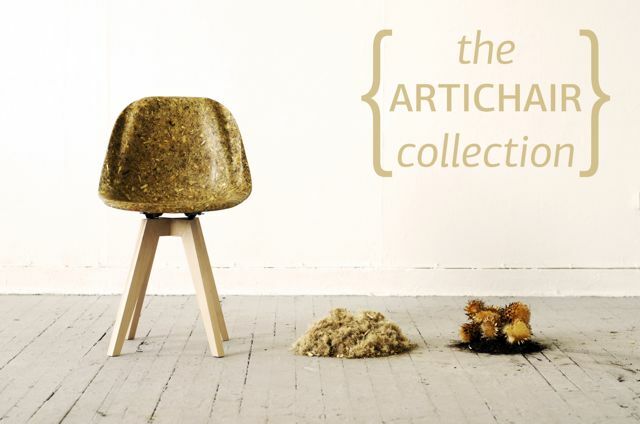 The Well Proven stool by Marjan van Aubel and James Shaw makes use of shavings, sawdust and chippings. When combined the mixture of bio-resin and waste shavings create a chemical reaction that expands into a foamed structure five times its original volume. The porridge like mixture can be coloured with dyes and moulded. It hardens to form a strong, lightweight material, reinforced by the fibres in the hardwood shavings. The ‘porridge’ is spread over the underside of a chair and shaped by hand around the contrastingly elegant turned legs of American ash. The fore-runner of the stool, the Well-Proven Chair was nominated for the Design of the Year 2013 Award an developed with the support of the American Hardwood Export Council. 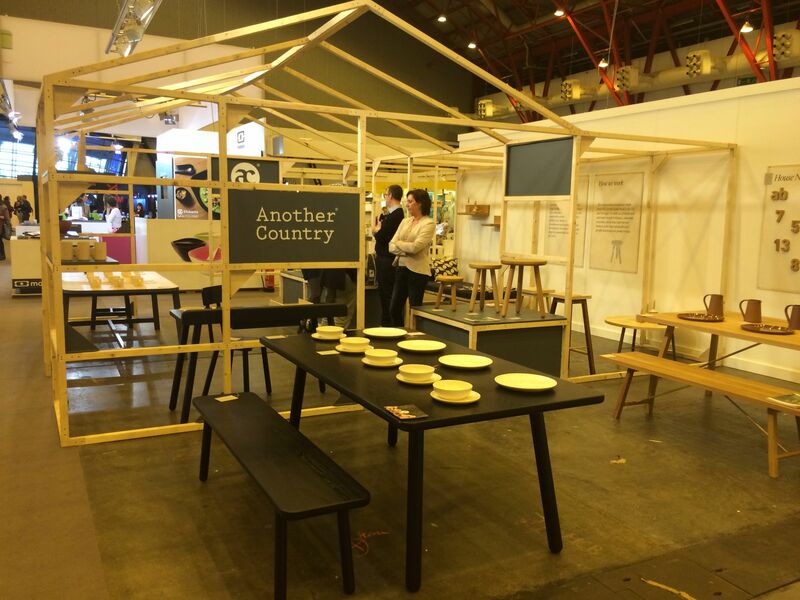 The stools were on display as part of Heal’s Modern Craft Market in February 2014. I think I have met the ultimate materials girl. 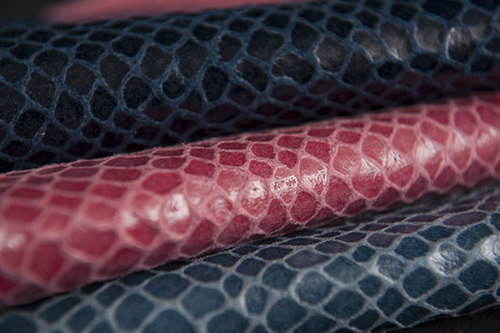 Annabelle Filer, architect, journalist and founder of the SCIN Gallery (pronounced skin) is passionate about materials. While working as an architect Annabelle developed a fascination, even addiction, for materials, their properties and practical applications. While she continues regular contributions to FX Design magazine (and formerly Grand Designs Magazine), four years ago SCIN was launched to show and share this passion and encyclopaedic knowledge of materials. SCIN source and advise on finishes for every surface inside or outside buildings of every scale. 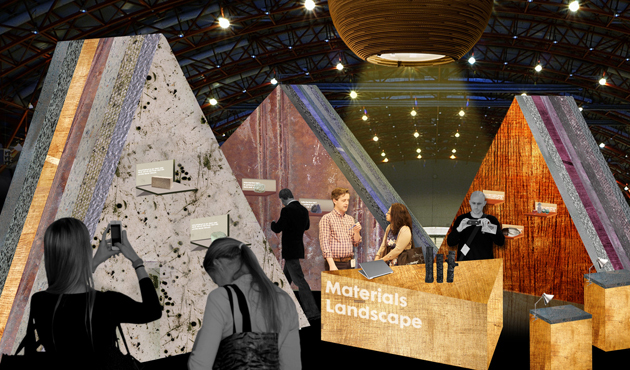 Working with materials experts sourcing from around the world, SCIN’s sphere of knowledge reaches to the limits of current research, and if SCIN can’t find what their clients are looking for they can work with them to develop it. SCIN is committed to introducing more materials with ‘green’ credentials, and “fundamentally believe that environmental or sustainable design heralds a new era in architecture and design”. So after whetting my appetite at the Surface Design Show, I headed to the SCIN Gallery to learn more. The ground floor is dedicated to new material design. First to catch my eye were some bowls (pictured right) made out of ‘decafé’ a material created by Raúl Laurí from used coffee grounds. 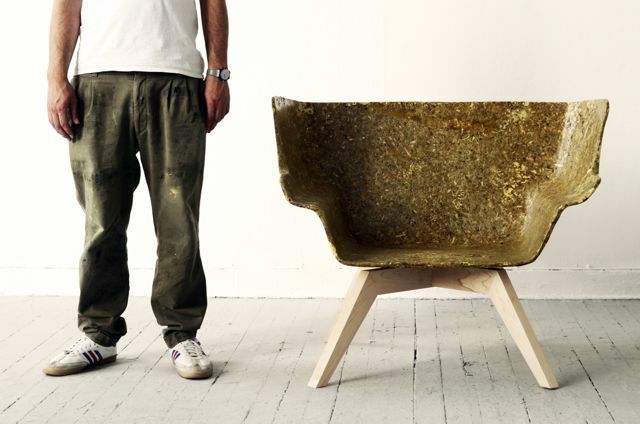 Alongside was Coleoptera, a bioplastic made from dead beetles, developed by Aagje Hoekstra. The shells of the beetles, a by-product of the animal food industry, contain chitin. After cellulose, chitin is the most common polymer on earth and, with a little chemistry, is transformed into chitosan which bonds better and is already being made into jewellery. From insect to marine life and exotic leathers made from salmon, perch, wolffish and cod fish skins by Icelandic tannery, Atlantic Leather. Other exhibits included Denimite, a cotton fibre bio-composite made from recycled denim suitable for countertops and architectural applications and Soilid (pictured left). 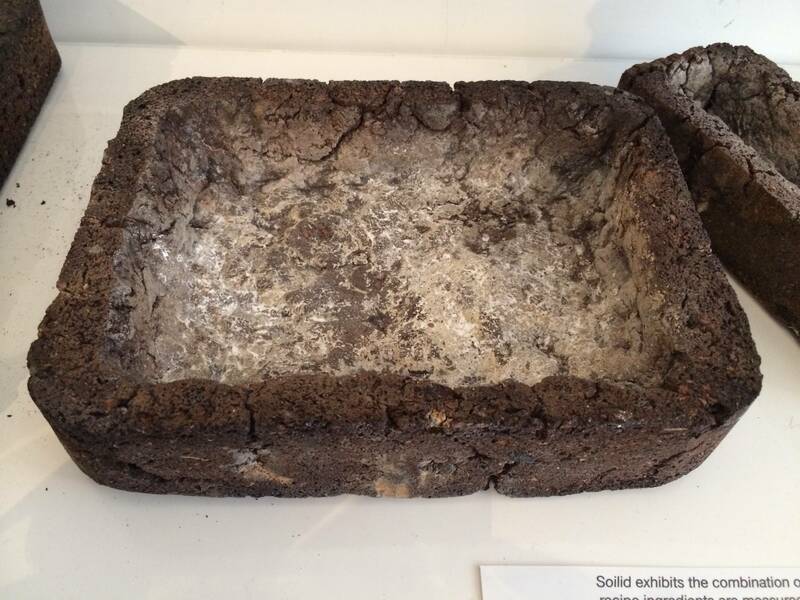 Made from a mixture of soil, fungi and other natural materials left overnight at room temperature to “rise”, the mixture can then be poured into a mould and baked becoming strong enough sand, saw or drill. The first floor showcases architectural materials, such as Polluted Pattern (pictured right). 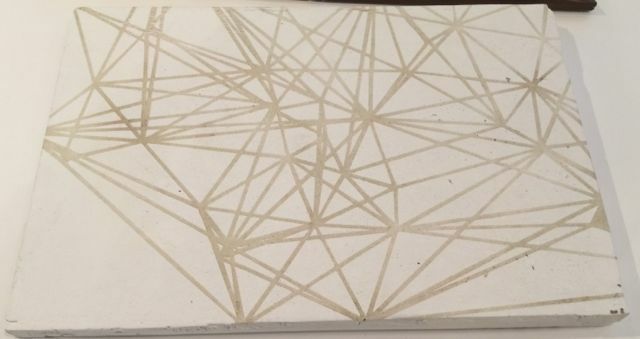 A concrete surface printed with a photo-catalytic white i.active cement based on TX Active nanotechnology that self-cleans and breaks down air-pollutants. Over time, the printed sections stay pristine, while pollutants discolour the unprotected areas revealing the printed lace-like pattern, a metaphor for pollution wrapping our cities. The material would be suitable for urban surfaces, pavements, facades. 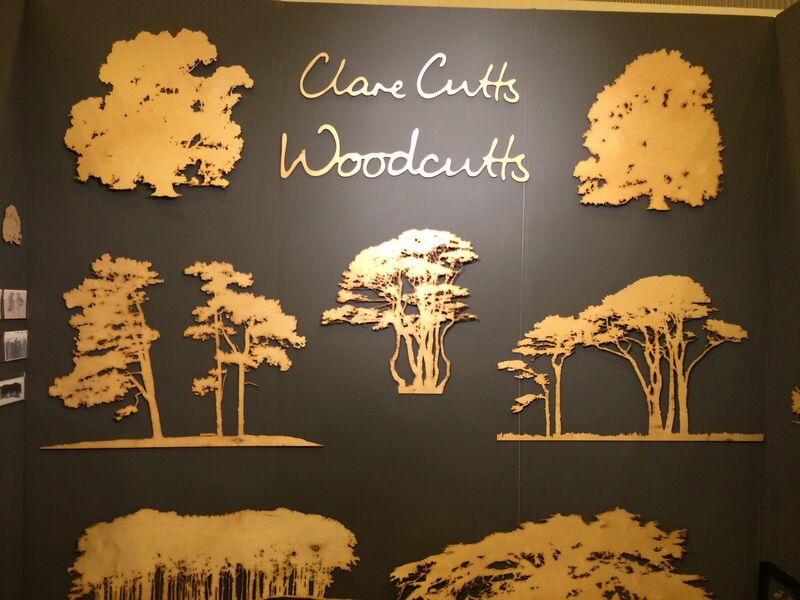 The installation ‘The Forest Commissioned’ displayed some leading wood products including Accoya, a high-performance wood created from softwood using a proprietary non-toxic acetylation process that gives it the dimensional strength and durability make its suitable for windows, cladding and other architectural uses. Showered with eco-labels including FSC, PEFC, and Cradle to Cradle™ to name but three, Accoya is made from renewable sources, fully-recyclable, and looks good to boot. 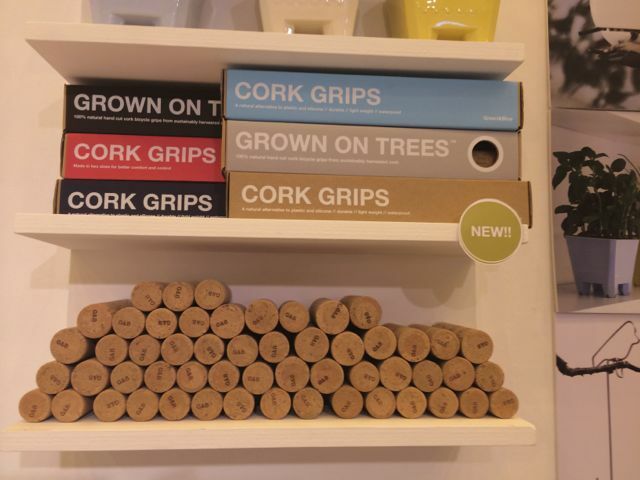 It is distributed in the UK by Lathams. 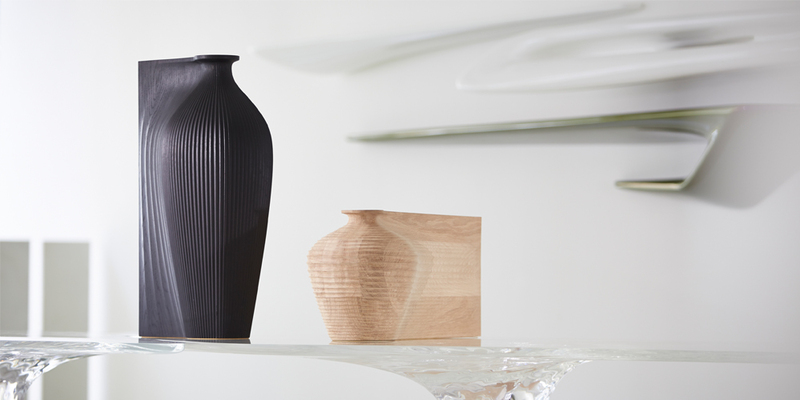 UPM Grada is a new thermoform able wood made from FSC or PEFC rotary cut birch veneers and non-formaldehyde adhesive. Interiors products occupy the second floor. Marbelous Wood (pictured at the top of the page) and Green Hides (pictured right) were just two of the exhibits currently on display. 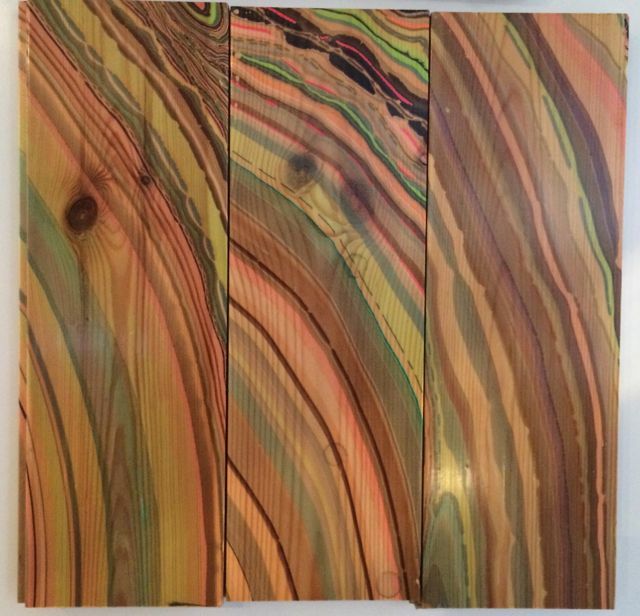 Marbelous Wood, from the Danish Snedker Studio, uses an old marbling technique to create an organic and colourful play on the natural grain of the wood. A decorative reinterpretation of a flooring choice favoured by many. Green Hides‘ Ecolife Italian leathers are processed with chrome-free, natural vegetable tanning and solvent-free finishing methods to meet stringent technical specifications that mean they are suitable for home and contract clients. If the temporary installations are not inspiration enough, the basement is home to a permanent materials library. The SCIN library is a colourful and tactile treasure trove with thousands of samples catalogued by material and property in bright orange boxes. Solid wool and paper stone I have seen before, but insulation made from seaweed was a surprise. 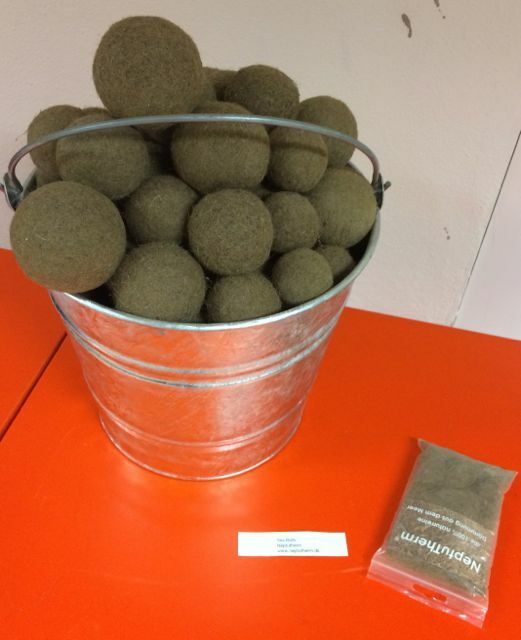 NeptuTherm (pictured left) is an insulation material made from neptune grass seaweed that has become matted together into balls in shallow water. Often considered a waste product, in fact, without chemical treatment this material is naturally flame retardant, mould resistant and helps regulate humidity without degrading its thermal insulation capacity. Seaweeds’ wonderful properties extend far beyond sushi and face creams! And finally a product that is simply joyful, if not immediately robust enough for a home with two small children, but if I could, I would find a place for some decorative Organoids panels (pictured right). 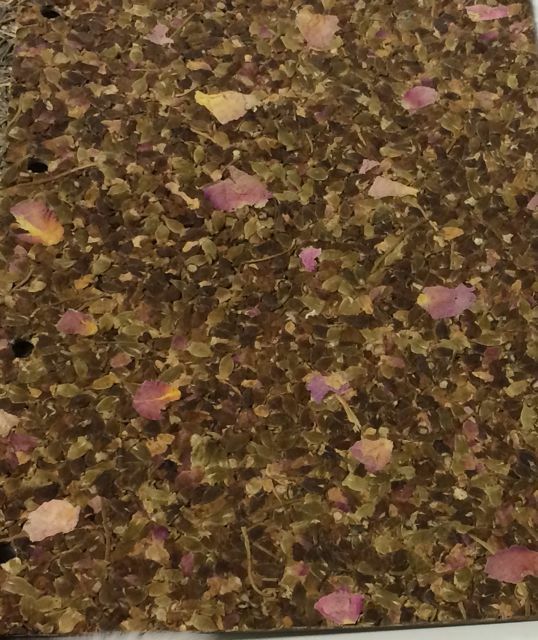 Natural fibres (in this case rose petals and rose buds) are ground up and mixed with a natural binder, then covered with a vacuum film, compressed and hardened to make a biocomposite that is 100% biodegradable. The decorative panels are a sensual experience, the aroma of the rose buds, texture of the panel and visible rosebuds a reminder of the natural materials. The process is entirely free of biocides, plasticisers and solvents and powered with 100% green electricity. So whether wrestling with the refurbishment of a Victorian terrace house or in search of a supernatural material to make a car fit for James Bond, the library is a rich repository of innovative, practical and green materials. 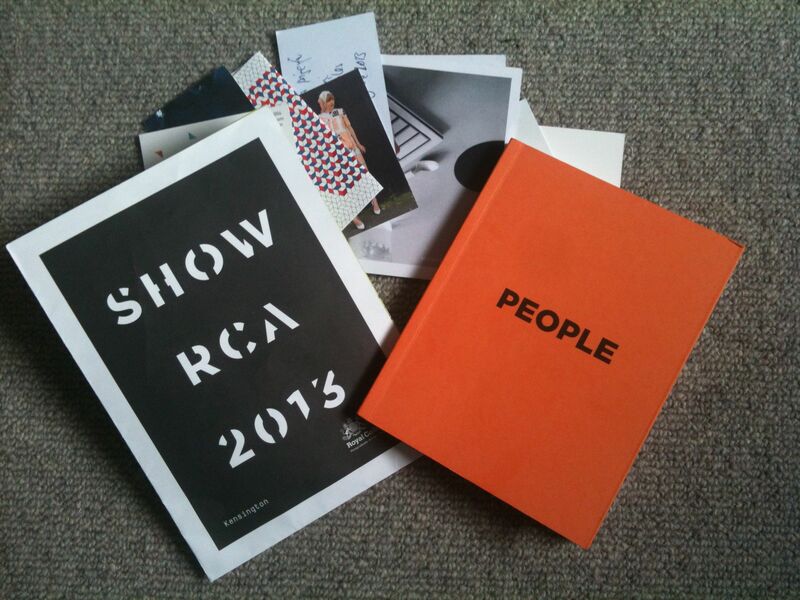 Architects, designers and consumers are all welcome to have a rummage, by appointment. You too could get addicted!